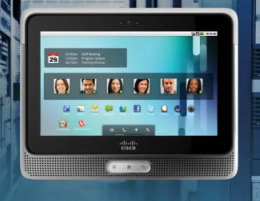 It seems to me that Cisco want to compete with Apple on the touch screen devices market. The Cisco Cius product confirm this. OK, skipping the funny part of this story, honestly I believe that Cisco is making efforts to take the (still) open part of the tablet devices market that is not so developed in this moment, and by this I mean the touch screen devices for professional use. While companies like Apple focus their efforts to develop home use friendly devices, Cisco want to apply the same success recipe for the business sector. The launch of the iPad was enough to make Cisco think that Apple’s platform can be adapted for business use and in this idea they developed Cius. Cisco is also negotiating with six phone companies around the world to procure their services for Cius. The tablet5 device from Cisco will feature the ability to connect to Wi-Fi hot spots and cellular broadband networks. The Cius is expected to be sold for less than a $1,000 and if Cisco is able to make a dent in the sales of iPads by attracting customers, then I’m sure that other companies will jump on this “train” developing similar products. Below, I you can enjoy 2 videos of the Cisco Cius product. One is the designed for the marketing purpose, but the second one has an interesting “hands on” demo. Before expecting solid results out of your article marketing efforts you have to 1st think out a good system for substantial article distribution.